Tuesday November 28th 1899 Worked at picking the ducks getting 16 more done and all ready to send to town. did churning after supper. The weather has been fine. I am very tired. 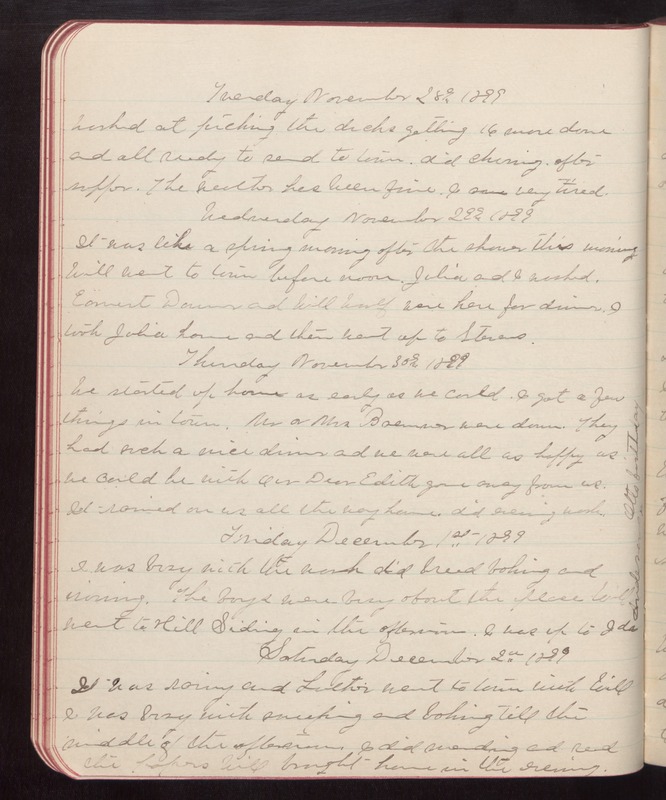 Wednesday November 29th 1899 It was like a spring morning after the shower this morning Will went to town before noon. Julia and I worked. Earnest Donner and Will Woolf were here for dinner. I took Julia home and then went up to Stevens. Thursday November 30th 1899 We started up home as early as we could. I got a few things in town. Mr and Mrs [Bremner] were down. They had such a nice dinner and we were all as happy as we could be with our Dear Edith gone away from us. It rained on us all the way home. did evening work. Friday December 1st 1899 I was busy with the work did bread baking and ironing. The boys were busy about the place Will went to Hill Siding in the afternoon. I was up to Ida Andersons. Otts birthday Saturday December 2nd 1899 It was raining and Luther went to town with Will I was busy with sweeping and baking till the middle of the afternoon. I did mending and read the papers Will brought home in the evening.